The holidays make us reflect upon the nearly-gone year. SmartyPlants finished its third year in business only a few weeks ago (November 3rd), and as we embark on our fourth year, we strive to become better and better. We can't believe that three years have gone by. This project turned out to be quite a bit more laborious than we ever anticipated, but your constant positive comments and continued support emphasize to us that we are on the right track. We will continue to work hard to provide you, our valued customers, with quality products and a comfortable and enjoyable place to visit. We wish you and yours a wonderful Holiday Season filled with what makes you happy and with what's important to you. We will be open on Christmas Eve from 9 a.m. 'til noonish. We will celebrate with family on Christmas Day and will re-open for business on the 26th. 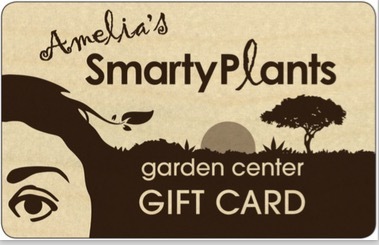 For unusual gifts and a peaceful and enjoyable experience, come to SmartyPlants to do your holiday shopping. 20% off selected mossed animals. 15% off Spathiphyllum - This is one of the top 3 plants known for its air-purifying properties. The other two are Philodendron Pothos and Spider Plants. We have them all. Last but not least, 20% off Viducci's BROWN glazed ceramic pots. I'm willing to bet that most of you will be preoccupied with holiday endeavors, and that tending to your garden will likely resume as one of your new-year resolutions. At that time, we will have plenty of tips for you to implement to get or maintain your garden in tip-top shape. For now, enjoy every bit of the holidays and stop by SmartyPlants to relax while you shop.